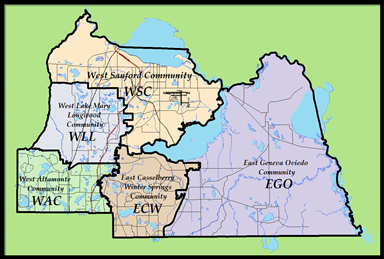 The maps indicate Part 1 Crimes which have been reported to the Sheriff's Office for the respective month and include only those reported in unincorporated Seminole County. The incidents displayed represent only the first, most serious offense. For example, if a crime occurred which included Aggravated Assault and Burglary, only the Aggravated Assault would be reported since it is the more serious offense. To obtain more specific information about calls for service or offense reports in a particular area, you may make a public records request by clicking here.